ARGAUM slipped up in the race for the play-offs at lowly Dartmouth on a day when if anything could go wrong, it did. 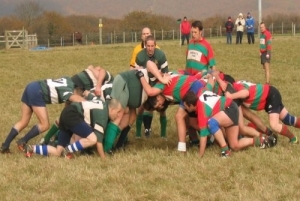 PROP Mark Handley was Argaum's sole points scorer in this defeat at Bickleigh Down. Dartmouth fly-half Marc Cresswell proved to be the key player in his side's comprehensive victory. The success was Darts' first of the campaign, while Argaum have yet to win this term. CENTRE Nick Obolensky hit the Chiefs with two early tries, as the Argaum side struggled again with selection problems. Experience triumphs over fitness and speed! Lacking nothing in fitness and speed, the Benbows kept Argaum fully extended at Dartmouth, but superior weight and experience won the game for the visitors by a goal two tries and a penalty goal to nil. Gibbs, in his first game, worked hard at scrum-half, and thrustful play by the Plymouth backs resulted in a try from Kingwell, to which Baker added a penalty goal. Good defensive work by Metters and Rhodes kept Dartmouth at bay, and further tries were added by Pooley and Kingwell. Baker converting one.